Welcome to Admission Foreword - a blog about trends in education by Gerard Gonnella '89, Director of Admission and Financial Aid. But how and what food we consume is more than a pleasurable experience. It reflects the complex relationship between individuals and culture. “Food is our common ground, our universal experience,” says James Beard. Every day at W-H we share our belief in global interconnectedness and we provide a menu of opportunities for our students to engage and experiment even beyond the academic arena. How we eat, when we eat or don’t eat, why we eat certain foods or where we eat tells us so much about ourselves and others. Yet food also cultivates distinction. And understanding difference, opening our palettes to an array of flavors and textures, spices and ingredients, helps us balance commonality and difference and develop a wider perspective and a deeper appreciation. When I was teaching, I would often spark a conversation by asking, “What can you learn about a culture by looking inside a person’s refrigerator? If indeed there was a refrigerator to be investigated! Food flavors our health, our environment, our economy, social justice. It determines sustainability; it compels us to consider big questions like the possible dangers of genetically modified foods. And it encourages us to think globally. So I peeked into the W-H refrigerator to see what today’s lunch menu included. I saw not only a variety of ethnic foods, but a commitment to using local and organic products. When I chatted with Anibal Rodriguez, our chef, I came to realize that we recycle fryer waste oil to be used for biodiesel fuel, we buy hormone-free and antibiotic-free milk as well as use shell eggs that are Certified Humane. I learned that we support fair trade practices. I saw that our menus change to reflect seasonal products. “Diverse options help educate our children in healthy eating,” said Anibal, who believes that exposure to a variety of food “opens children’s minds” and appetites. His personal goal is to serve nutritious food from all the countries whose flags hang in our AP Room. 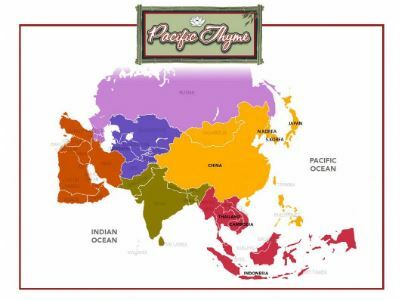 He’s enjoyed offering the new Pacific Thyme initiative (authentic flavors of the Asian Pacific Rim) and the Paquitos (authentic Latin cuisine) Menus. On any given day one can count on a selection of culinary offers that may include Dominican Carne Guisada, Curried Quinoa and Mango Salad, Vegetarian Mapo Tofu, Sticky Rice, Couscous Salad with Tomatoes and Feta, Thai Edamame Salad, Lemon Hummus, Bengali Dhal, House Made Cinnamon Raisin Granola, Sunflower Seed Butter and Jelly. Sage, our food service provider, believes they should “Create exceptional dining experiences that delight the senses, inspire minds and foster community.” And indeed they have. Their menus not only please the palette, but they encourage experimentation, make learning experiences more accessible and go beyond our school’s borders. Food demonstrates who we are, how our culture and belief systems are shaped. Food helps us transform the essential need to eat into a mutually respectful expression of our lives and connects us to one another and our world.